4Department of Surgery, VA Puget Sound Health Care System, Seattle, USA. Received May 11th, 2010; revised June 18th, 2010; accepted July 11th, 2010. Gallbladder cancer is the most common malignant tumor of the biliary tract and often diagnosed incidentally during laparoscopic cholecystectomy for gallbladder disease. This underscores the importance of considering the diagnosis of gallbladder cancer when confronted with atypical findings and understanding cancer management guidelines that may impact patient outcome. Potentially curable early stage gallbladder lesions are often missed during preoperative workup and discovered incidentally during difficult cholecystectomy or afterwards on pathologic diagnosis. We will review current strategies to diagnose early stage disease and discuss clinical management issues to optimize the outcome of patients with gallbladder cancer. Gallbladder cancer is the most common malignant tumor of the biliary tract and early-stage disease is typically diagnosed incidentally with the widespread adoption of laparoscopic cholecystectomy for symptomatic gallbladder disease. It has been estimated that approximately 1% of elective cholecystectomies will result in an unexpected diagnosis of gallbladder cancer [1,2] . As laparoscopic cholecystectomy represents one of the most common general surgery procedures performed in the United States with over 700,000 cases each year  , it underscores the importance that all surgeons and practitioners consider a differential diagnosis of gallbladder cancer when confronted with atypical findings and be familiar with cancer management guidelines that directly impact patient outcome. Since advanced gallbladder cancer is associated with a uniformly dismal prognosis, we view the diagnosis of early-stage disease as a critical step in clinical management. It is important to maintain a certain level of suspicion in all patients presenting with right upper quadrant complaints. Potential curable early stage gallbladder lesions are often missed during preoperative workup and discovered incidentally during difficult cholecystectomy or afterwards on pathologic diagnosis. We will review current strategies to diagnose early gallbladder cancer and discuss clinical management issues to optimize the outcome of patients with gallbladder cancer. Cancers of the extrahepatic biliary tract are the sixth most common gastrointestinal malignancy diagnosed in the U.S. exceeding 9000 cases per year . Gallbladder cancer, typically a highly aggressive and lethal malignancy, represents nearly two-thirds of these cases. Rates of gallbladder cancer vary widely by geographical location. Native North and South American populations report the highest rates of disease, while gallbladder cancer is rarely seen among Caucasian populations in Western Europe and the United States. Additionally, incidence rates within the United States are noted to be higher among certain ethnic populations such as Native and Hispanic Americans [5,6] . This geographic and ethnic distribution closely parallels the epidemiology of gallstone disease, which is considered an important risk factor for the development of gallbladder cancer . Gallbladder carcinoma is also more common in females by nearly a 3:1 ratio compared to men, and incidence increases with advancing age . While no definitive cause has been identified for the development of cancer of the gallbladder, several etiologic risk factors have been described. Cholelithiasis has long been associated with the development of gallbladder cancer [7-9] with gallstones reported in over 90% of patients with gallbladder cancer. The epidemiologic profiles of gallstone disease and gallbladder cancer are similar, with higher rates observed among women, elderly, and certain ethnic groups. Chronic cholecystitis and porcelain gallbladder have also been associated with an increased incidence of gallbladder cancer [10-12] . The chronic inflammatory state associated with both conditions has been proposed as an important factor promoting the development of mucosal dysplastic changes that progresses to invasive carcinoma . Other reported risk factors for the development of gallbladder cancer include the presence of choledochal cysts, adenomatous gallbladder polyps, obesity, tobacco smoking and various occupational chemical exposures including azotoluene and nitrosamine [5,13]. Early suspicion and diagnosis of gallbladder cancer is one of the most challenging aspects of clinical management since presentation can be highly variable. Patient complaints such as intermittent right upper quadrant pain, fever, or shoulder pain are more often attributed to cholelithiasis and cholecystitis rather than an underlying malignancy. Patients who present with jaundice, weight loss, or persistent right upper quadrant pain from gallbladder cancer are usually found to have locally advanced or metastatic disease, and are often not suitable candidates for curative resection. Preoperative diagnosis of early stage disease is often difficult secondary to low clinical suspicion, lack of specific presenting signs and symptoms, and equivocal imaging findings. Yet, it is at this stage that the diagnosis is most important as it is in this stage that adequate planning for the operation will have significant impact on patient survival. Certain findings on imaging studies should raise the suspicion of a patient at risk of an underlying gallbladder cancer. Mass lesions, gallbladder polyps, and porcelain gallbladder can easily be identified by standard imaging studies used to workup gallbladder disease and warrant specific attention. Ultrasound is usually the first imaging study obtained in the workup of suspected gallbladder pathology because of its low cost, widespread availability and accuracy in diagnosing gallstones/sludge and other types of gallbladder disease. In spite of its high sensitivity for the detection of tumor in advanced stages, it is limited in the diagnosis of early lesions and is unreliable for staging. Gallbladder carcinoma may appear as a mass completely occupying or replacing the gallbladder lumen, but can also have a more subtle appearance such as focal or diffuse asymmetric wall thickening or as an intraluminal polyp (Figure 1) . A mass occupying or replacing the gallbladder lumen is the most common pattern seen in 40-65% of the patients at initial detection. Direct invasion of the surrounding liver parenchyma is highly suggestive of gallbladder carcinoma [14,15] . On ultrasound, the tumor usually appears hypoechoic. However, necrotic tumor or trapped bile may be anechoic. Furthermore, echogenic shadowing foci from gall stones, porcelain gallbladder, or tumoral calcification may also be present . Focal or diffuse asymmetric wall thickening is seen in 20-30% of the cases. The differential diagnosis for gallbladder wall thickening is wide and includes acute and chronic cholecystitis, xanthogranulomatous cholecystitis, and adenomyomatosis. Systemic diseases such as acute hepatitis, portal hypertension, and congestive cardiac failure can also present with gallbladder wall thickening [15,17] . Asymmetric, irregular, or extensive wall thickening with marked arterial phase enhancement that persists or becomes isodense or hypointense to the liver in the portal venous phase should heighten the suspicion of gallbladder carcinoma (Figure 2) [18,19] . Figure 1. 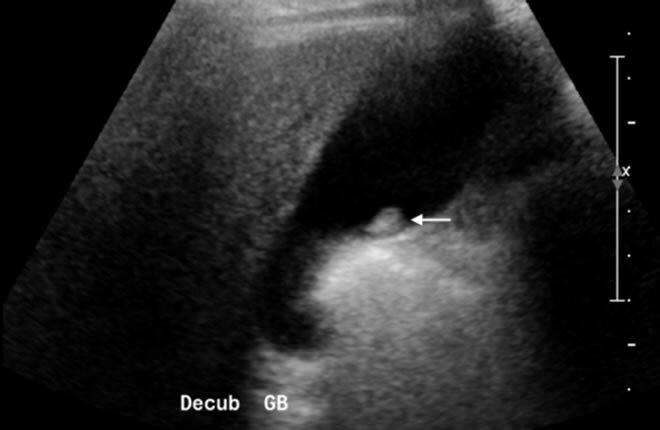 US image of an immobile echogenic focus arising from the gallbladder wall consistent with a gallbladder polyp (arrow). Figure 2. 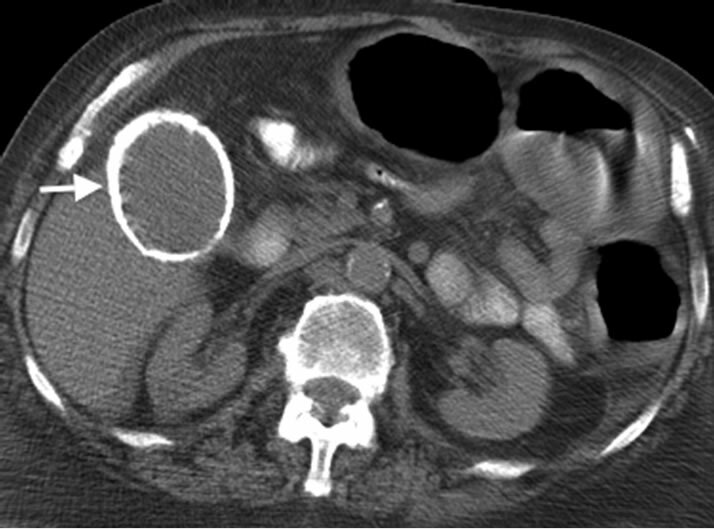 Contrast-enhanced CT scan axial image of a patient with gallbladder carcinoma. Soft tissue enhancing mass is seen in the gallbladder lumen (arrow). Two gall stones are also present. Polyps are immobile echogenic foci arising from the gallbladder wall (Figure 1). At the time of ultrasound, if there is notable movement of a polypoidal mass, biliary sludge or clot can be diagnosed. Malignant lesions of the gallbladder present as a polypoidal lesion in 15-25% of cases and are usually larger than 1 cm with a thickened implantation base. Polypoid lesions of less than 1 cm are rarely cancer . The differential diagnosis of a polypoid gallbladder lesion includes adenomatous or hyperplastic cholesterol polyps as well as uncommon tumors such as carcinoid or melanoma metastases . Most radiologists typically recommend follow-up sonograms at 6- to 12-months intervals for polyps between 5 mm and 1 cm in size  . FDG-PET has a limited role in this setting and may result in false-positive interpretations  . CT and MRI are more widely used for the characterization of potentially malignant gallbladder lesions and to evaluate the extent of metastatic disease . Primary gallbladder carcinoma is usually hypodense on unenhanced CT and enhances after IV contrast administration. On MRI, gallbladder carcinoma is usually hypoto isointense on T1-weighted and moderately hyperintense on T2-weighted sequences. On both CT and MRI, intense irregular enhancement may occur at the periphery of larger lesions during the early arterial phase. Enhancement may be retained in the fibrous stromal components of the tumor in the portal venous and delayed phases, aiding differentiation from the classic hepatocellular carcinomas which have a greater tendency to washout [15,18] . Multidetector CT (MDCT) has a reported accuracy of 85% in the evaluation of the extent of local disease and in predicting respectability through its ability to delineate hepatic and vascular invasion, lymphadenopathy, and distant metastases [15,23,24] . Multiplanar and 3-D volume-rendered reconstructions are useful for surgical planning. MR cholangiopancreatography (MRCP) and 3-D MR angiography can reliably detect bile duct and vascular invasion, but are less sensitive for distinguishing hepatic invasion and lymph nodal metastases compared to CT  .
PET imaging can demonstrate intense uptake of 18-F-FDG for malignant gallbladder tumors, but lacks the sensitivity in distinguishing primary gallbladder carcinoma from other malignant lesions that can invade the gallbladder fossa such as hepatocellular carcinoma, cholangiocarcinoma, or metastatic disease . However, PET-CT has the potential to detect unsuspected metastases and alter staging and therapy [22,26] . Prospective studies directly comparing the efficacy of CT, MRI, and PET-CT to diagnose and stage gallbladder carcinoma have not been performed . In spite of the timing of diagnosis in relation to definitive surgery, gallbladder cancer prognosis is dependent on staging as outlined by the American Joint Committee on Cancer TNM staging classification. Significant changes in the most recent 7th edition introduced in January 2010 include the designation of cystic duct involvement, distinction between involvement of regional hilar lymph nodes and distant regional nodes (celiac, periduodenal, peripancreatic, and superior mesenteric nodes), and a reclassification of unresectable locally advanced T4 tumors as stage IV disease (Table 1). Gallbladder cancer is a highly aggressive malignancy with disappointingly low rates of long term survival, especially for patients with locally advanced (T4), node positive (N1/2), and metastatic (M1) disease. Generally speaking, gallbladder cancer patients presenting with symptomatic disease are often found to have unresectable stage IV disease and typically palliated with conservative systemic therapy. Despite the aggressive nature of this disease, carefully selected patients with nodal metastases have been reported to undergo radical resection with observed 5-year survival rates between 26-45% [27-30] . Table 1. 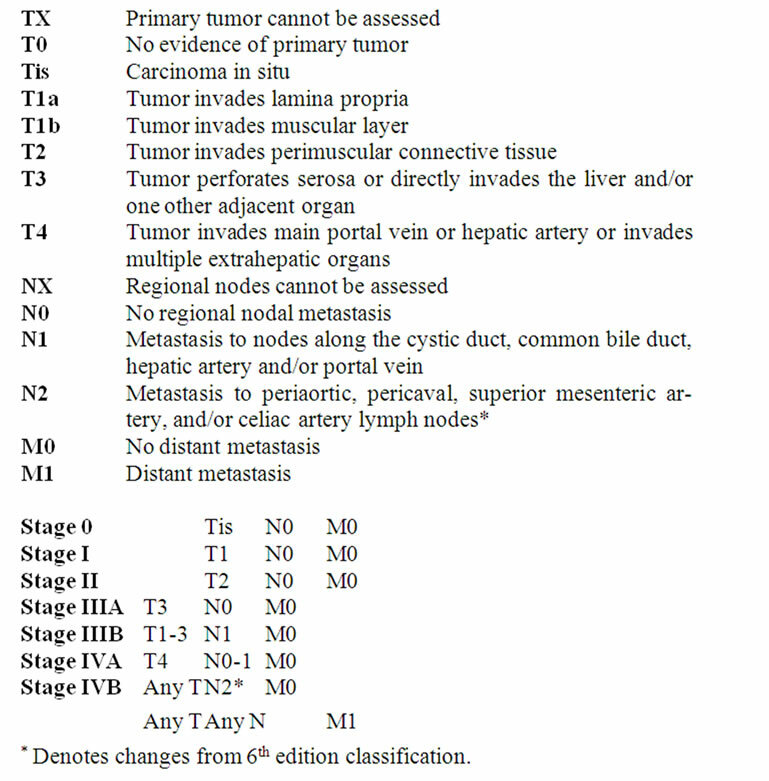 TNM staging classification for gallbladder cancer (AJCC, 7th Ed.). gallbladder cancer with the specific procedure primarily dictated by the T stage of disease. Tis and T1a tumors are adequately treated by simple cholecystectomy with expected 5-year survival rates between 90 to 100% [31-33] . Outcomes for more advanced T stage tumors treated by simple cholecystectomy are significantly worse. T1b and T2 tumors are best treated by radical cholecystectomy which consists of an extended gallbladder resection including partial liver segments IVB and V and portal lymphadenectomy, a procedure that should be performed in centers with high volume of extrahepatic bile duct and liver resections. In addition to radical cholecystectomy, T3 tumors may also necessitate en bloc resection of any involved adjacent viscera. Extrahepatic bile duct resection, more extensive hepatectomy, and combined with pancreaticoduodenectomy has been described for advanced cases with cystic duct or extrahepatic bile duct involvement with unclear survival benefit [28,34,35] . As was the case in patients who need a careful segment IVB and V resection, we recommend that these patients be treated in centers that specialize in complex hepatobiliary resections. Most early stage tumors are unrecognized and patients frequently undergo laparoscopic cholecystectomy for presumed symptomatic cholelithiasis or acute cholecystitis. Despite advances in ultrasound and CT imaging, small tumors confined to the mucosa often escape detection with currently available imaging modalities. If there is any equivocal imaging or intraoperative findings, it is imperative that the resected gallbladder specimen be opened and carefully inspected by the primary surgeon to assess for any suspicious mucosal lesions. If they are found, the specimen should be evaluated by a surgical pathologist immediately. Even if the surgeon is unprepared to proceed with a more radical resection as indicated for T1b or greater tumors, establishment of a definitive pathologic diagnosis will expedite further staging workup and referral to an experienced hepatobiliary surgeon. It is of paramount importance for the primary surgeon to document any unintended events such as gallbladder injury with resultant bile or stone spillage, and to liberally utilize a specimen retrieval bag for gallbladder removal to minimize intraabdominal dissemination and wound or port site contamination. The majority of T1 tumors are discovered following uneventful cholecystectomy on final pathologic analysis. Cure rates for invasive disease limited to the mucosa treated by simple cholecystectomy exceed 90% provided negative resection margins are confirmed. Cystic duct margin status should be carefully noted as a positive duct margin may necessitate more aggressive re-resection to achieve an R0 resection status, even if biliary reconstruction will be required. Controversy exists over the benefit of performing radical cholecystectomy in patients with T1b tumors invading the gallbladder muscular layer. Several recent series have demonstrated decreased survival for patients with T1b tumors treated by simple cholecystectomy alone [33,36-38] . Patients with T2 disease invading through the muscular wall whom are medically fit and without evidence of distant disease should be offered radical re-resection since recurrence rates can be expected to exceed 30% with cholecystectomy alone . The advent and widespread application of minimally invasive surgery has been shown to improve patient outcomes. Decreased patient morbidity, hospital length of stay, pain medication requirement, and return of bowel function are commonly associated with laparoscopic abdominal procedures with high patient satisfaction. The use of minimally invasive surgery techniques in GI cancer patients is a controversial topic with limited evidence available to establish standard practice guidelines  . Though a well conducted randomized trial demonstrated oncologic equivalence for laparoscopic colectomy in the treatment of colon cancer [40,41] , the efficacy of minimally invasive procedures for other GI malignancies remains unproven. There are specific technical aspects of gallbladder surgery that deserve particular attention including avoidance of bile contamination and port-site recurrence. Additionally, there have been reports of specific immunologic changes associated with abdominal insufflation (and circulation and re-circulation of CO2) used during laparoscopic surgery . Laparoscopic abdominal procedures in animal models have shown decreased cell-mediated immunity and stimulation of cytokine responses which may impact host-tumor responses. One human study reported elevated plasma levels of vascular endothelial growth factor (VEGF), a potent promoter of tumor vascular angiogenesis, following laparoscopic resection for colorectal cancer  . Further studies are needed to determine whether these described biologic and immunologic responses impact cancer prognosis in patients undergoing minimally invasive resection. Patients diagnosed with T1b, T2, and T3 tumors who do not have distant metastatic disease and who are otherwise fit for a major operation should be treated by an extended resection with curative intent. Radical cholecystectomy consists of cholecystectomy (if not previously performed), partial liver resection of segments IVB and V which contain the gallbladder fossa, combined with portal lymphadenectomy and extrahepatic bile duct resection when there is evidence of cystic duct or hepatic duct involvement. The improved survival benefit of radical resection has been clearly demonstrated in numerous studies compared to simple cholecystectomy [6,44-46] . With the widespread adoption of laparoscopic cholecystectomy, increasing numbers of early stage gallbladder tumors are diagnosed postoperatively and concern exists whether prognosis is negatively impacted by delayed recognition and two-staged surgical approach. Intraoperative gallbladder perforation has been demonstrated to upstage and negatively impact survival even for patients with T1 lesions [3,47] . It is therefore prudent to maintain a low threshold for open cholecystectomy if preoperative imaging is suggestive of an underlying malignancy or conversion to an open procedure if intraoperative findings are suggestive of an invasive gallbladder tumor. Regardless of initial open or laparoscopic approach, Fong et al. and others have demonstrated equivalent outcomes following re-resection when compared to patients undergoing immediate definitive management [47-50] . These data indicate that a delayed surgical approach for definitive treatment, regardless of the initial cholecystectomy technique does not adversely affect outcome provided the integrity of the gallbladder wall is maintained. Advanced gallbladder cancer can present with peritoneal metastasis and port-site recurrences which has been reported in 2-28% of patients following laparoscopic cholecystectomy [33,51] . It should be noted that early studies reporting high port site recurrences were likely conducted prior to the routine use of gallbladder retrieval bags. Recent studies have demonstrated equivalent rates of wound recurrences when comparing open versus laparoscopic cholecystectomy for early gallbladder cancer . Whether wound recurrences are the result of technical complications of cholecystectomy, biologic properties of laparoscopic insufflation or an indicator of tumor biology is unknown. Careful avoidance of gallbladder perforation and use of a retrieval bag are important measures to consider during difficult laparoscopic cholecystectomy and may be an indication for conversion to an open procedure. Though the effect on long term outcomes is debatable, we advocate routine port-site resection if there is evidence or suspicion of prior tumor contamination at the time of radical cholecystectomy. Figure 3. Portable abdominal radiograph showing densely calcified wall (arrow) of the gallbladder consistent with a porcelain gallbladder. porcelain gallbladder and gallbladder cancer and have reported rates of incidental carcinoma in 12-61% of porcelain gallbladder specimens. This has led many to advocate elective cholecystectomy for all patients found to have radiographic evidence of porcelain gallbladder even in the absence of symptoms. Recently, the validity of this association has been challenged. Two large retrospective series evaluated gallbladder specimens and found a significantly lower incidence of gallbladder cancer in calcified gallbladders, and suggested that the pattern of calcification influences the risk [11,52] . No patients in both studies who had diffuse, transmural calcifications were found to have a primary gallbladder malignancy, while the incidence of cancer in specimens with selective mucosal calcifications was 7% . Patients diagnosed with porcelain gallbladder should undergo careful assessment. The risk of underlying cancer appears to be much lower than originally reported, but may be significant in specific situations such as those patients with selective mucosal calcifications. Management strategies should take into account patient preference, operative risk, and overall risk of underlying malignancy. 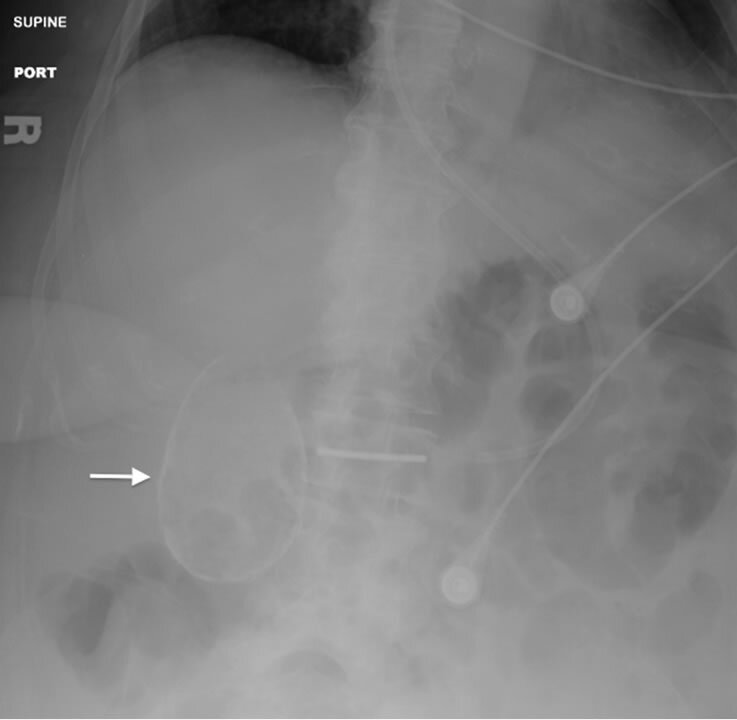 If operative intervention is undertaken, porcelain gallbladder is not considered an absolute contraindication to laparoscopic cholecystectomy, provided strict avoidance of gallbladder perforation and use of a specimen removal device is employed with a low threshold to open conversion. Figure 4. 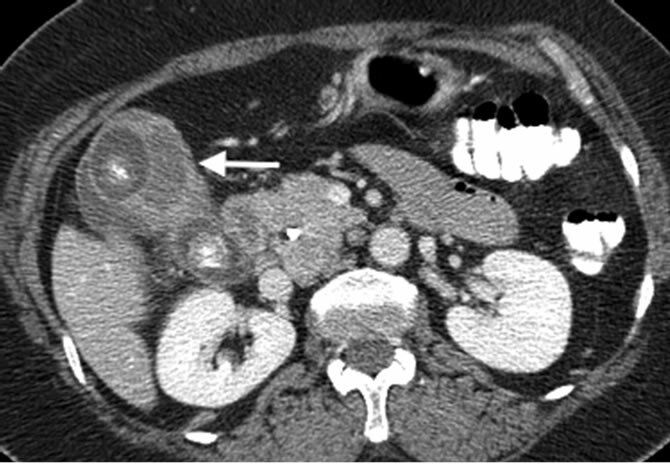 Axial CT scan image of the same patient with porcelain gallbladder (arrow). been demonstrated to be a significant predictor of poor outcome [30,44,53] . The recently updated AJCC staging criteria distinguishes regional hilar nodal metastases (stage III) from peripancreatic, periduodenal, celiac and SMA locations which are considered as distant metastatic disease (stage IV). Increasing T stage correlates with the risk of nodal metastases. T1 tumors are associated with a low risk of lymph node involvement between 0-12% [53,54] . However, T2 and T3 tumors have been shown to have a 31% and 46% incidence of nodal metastases, respectively  . The prognosis of patients with regional nodal metastases (N1) is poor with one well-established hepatobiliary center reporting a median survival of 18 months and 5-year survival of 17% in patient undergoing definitive resection  . Distant nodal metastases (N2) should be considered a contraindication for radical resection given that the outcomes of these patients are uniformly poor. In the absence of distant metastatic disease, including N2 disease, we advocate the inclusion of hilar nodal dissection during radical cholecystectomy to complete pathologic staging, provide important prognostic information, and achieve a negative margin (R0) resection. Proximal involvement of the cystic duct margin may benefit from extended hepatic parenchymal or extrahepatic bile duct resection. Careful pathologic assessment of the cystic duct margin following simple cholecystectomy is required when planning potential radical re-resection. Intraoperative evaluation with liberal use of ultrasound and frozen section analysis are useful adjuncts to adequately determine extent of potentially curative resection. While routine extrahepatic biliary resection has not been shown to provide additional survival benefit in the setting of a previously documented negative cystic duct margin, more extensive en bloc hepatic resection is recommended for locally advanced disease as an R0 resection offers the only chance for long term cure [28,54] . The role for adjuvant radiation and chemotherapy in the treatment of gallbladder cancer is unclear. While several studies have demonstrated modest survival benefits, numbers are small and randomized data is lacking. One study showed an improved 5 year survival of 26% for patients treated with 5-fluoruracil and mitomycin C compared to a control group (14%), however not all patients underwent complete R0 resection confounding interpretation of these results  . Currently, we do not recommend the routine use of adjuvant therapy following adequate definitive resection of gallbladder cancer outside a clinical trial setting. G. F. Whalen, et al., “Laparoscopic Cholecystectomy does not Demonstrably Decrease Survival of Patients with Serendipitously Treated Gallbladder Cancer,” Journal of the American College of Surgeons, Vol. 192, No. 2, 2001, pp. 189-195. K. Yamaguchi, et al., “Gallbladder Carcinoma in the Era of Laparoscopic Cholecystectomy,” Archives of Surgery, Vol. 131, No. 9, 1996, pp. 981-984. S. T. Weiland, et al., “Should Suspected Early Gallbladder Cancer be Treated Laparoscopically?” Journal of Gastrointestinal Surgery, Vol. 6, No. 1, 2002, pp. 50-56. A. Jemal, et al., “Cancer Statistics,” CA: A Cancer Journal for Clinicians, Vol. 58, No. 2, 2008, pp. 71-96. E. C. Lazcano-Ponce, et al., “Epidemiology and Molecular Pathology of Gallbladder Cancer,” CA: A Cancer Journal for Clinicians, Vol. 51. No. 6, 2001, pp. 349-364. N. G. Coburn, et al., “Surgery for Gallbladder Cancer: A Population-Based Analysis,” Journal of the American College of Surgeons, Vol. 207, No. 3, 2008, pp. 371-382. A. Csendes, et al., “Number and Size of Stones in Patients with Asymptomatic and Symptomatic Gallstones and Gallbladder Carcinoma: A Prospective Study of 592 Cases,” Journal of Gastrointestinal Surgery, Vol. 4, No. 5, 2000, pp. 481-485. A. W. Hsing, et al., “Gallstones and the Risk of Biliary Tract Cancer: A Population-Based Study in China,” British Journal of Cancer, Vol. 97, No. 11, 2007, pp. 1577- 1582. A. W. Hsing, et al., “Family History of Gallstones and the Risk of Biliary Tract Cancer and Gallstones: A Population-Based Study in Shanghai, China,” International Journal of Cancer, Vol. 121, No. 4, 2007, pp. 832-838. S. C. Cunningham and H. R. Alexander, “Porcelain Gallbladder and Cancer: Ethnicity Explains a Discrepant Literature?” American Journal of Medicine, Vol. 120, No. 4, 2007, pp. e17- e18. A. E. Stephen and D. L. Berger, “Carcinoma in the Porcelain Gallbladder: A Relationship Revisited,” Surgery, Vol. 129, No. 6, 2001, pp. 699-703. A. H. Kwon, et al., “Laparoscopic Cholecystectomy in Patients with Porcelain Gallbladder Based on the Preoperative Ultrasound Findings,” Hepatogastroenterology, Vol. 51, No. 58, 2004, pp. 950-953. M. T. Hueman, C. M. Vollmer, Jr. and T. M. Pawlik, “Evolving Treatment Strategies for Gallbladder Cancer,” Annals of Surgical Oncology, Vol. 16, No. 8, 2009, pp. 2101-2015. A. D. Levy, L. A. Murakata and C. A. Rohrmann, Jr., “Gallbladder Carcinoma: Radiologic-Pathologic Correlation,” Radiographics, Vol. 21, No. 2, 2001, pp. 295- 314. A. Furlan, et al., “Gallbladder Carcinoma Update: Multimodality Imaging Evaluation, Staging, and Treatment Options,” American Journal of Roentgenology, Vol. 191, No. 5, 2008, pp. 1440-1447. Y. Tsuchiya, “Early Carcinoma of the Gallbladder: Macroscopic Features and US Findings,” Radiology, Vol. 179, No. 1, 1991, pp. 171-175. A. C. van Breda Vriesman, et al., “Diffuse Gallbladder Wall Thickening: Differential Diagnosis,” American Journal of Roentgenology, Vol. 188, No. 2, 2007, pp. 495-501. K. Yoshimitsu, et al., “Dynamic MRI of the Gallbladder Lesions: Differentiation of Benign from Malignant,” Journal of Magnetic Resonance Imaging, Vol. 7, No. 4, 1997, pp. 696-701. E. J. Yun, et al., “Gallbladder Carcinoma and Chronic Cholecystitis: Differentiation with Two-Phase Spiral CT,” Abdom Imaging, Vol. 29, No. 1, 2004, pp. 102-108. H. Ito, et al., “Polypoid Lesions of the Gallbladder: Diagnosis and Followup,” Journal of the American College of Surgeons, Vol. 208, No. 4, 2009, pp. 570-575. J. Y. Park, et al., “Long-Term Follow up of Gallbladder Polyps,” Journal of Gastroenterology and Hepatology, Vol. 24, No. 2, 2009, pp. 219-222. T. Koh, et al., “Differential Diagnosis of Gallbladder Cancer Using Positron Emission Tomography with Fluorine-18-Labeled Fluoro-Deoxyglucose (FDG-PET),” Journal of Surgical Oncology, Vol. 84, No. 2, 2003, pp. 74-81. S. J. Kim, et al., “Accuracy of Preoperative T-Staging of Gallbladder Carcinoma Using MDCT,” American Journal of Roentgenology, Vol. 190, No. 1, 2008, pp. 74-80. N. Kalra, et al., “MDCT in the Staging of Gallbladder Carcinoma,” American Journal of Roentgenology, Vol. 186, No. 3, 2006, pp. 758-762. J. H. Kim, et al., “Preoperative Evaluation of Gallbladder Carcinoma: Efficacy of Combined Use of MR Imaging, MR Cholangiography, and Contrast-Enhanced DualPhase Three-Dimensional MR Angiography,” Journal of Magnetic Resonance Imaging, Vol. 16, No. 6, 2002, pp. 676-684. C. U. Corvera, et al., “18F-Fluorodeoxyglucose Positron Emission Tomography Influences Management Decisions in Patients with Biliary Cancer,” Journal of the American College of Surgeons, Vol. 206, No. 1, 2008, pp. 57-65. Y. Shirai, et al., “Radical Surgery for Gallbladder Carcinoma, Long-Term Results,” Annals of Surgery, Vol. 216, No. 5, 1992, pp. 565-568. M. D’Angelica, et al., “Analysis of the Extent of Resection for Adenocarcinoma of the Gallbladder,” Annals of Surgical Oncology, Vol. 16, No. 4, 2009, pp. 806-816. H. Onoyama, et al., “Extended Cholecystectomy for Carcinoma of the Gallbladder,” World Journal of Surgery, Vol. 19, No. 5, 1995, pp. 758-763. D. L. Bartlett, et al., “Long-Term Results after Resection for Gallbladder Cancer. Implications for Staging and Management,” Annals of Surgery, Vol. 224, No. 5, 1996, pp. 639-646. W. J. Zhang, et al., “Incidental Gallbladder Carcinoma Diagnosed during or after Laparoscopic Cholecystectomy,” World Journal of Surgery, Vol. 33, No. 12, 2009, pp. 2651-2656. S. B. Choi, et al., “Incidental Gallbladder Cancer Diagnosed Following Laparoscopic Cholecystectomy,” World Journal of Surgery, Vol. 33, No. 12, 2009, pp. 2657- 2663. R. Steinert, et al., “Laparoscopic Cholecystectomy and Gallbladder Cancer,” Journal of Surgical Oncology, Vol. 93, No. 8, 2006, pp. 682-689. M. Shoup and Y. Fong, “Surgical Indications and Extent of Resection in Gallbladder Cancer,” Surgery Oncology Clinics of North America, Vol. 11, No. 4, 2002, pp. 985- 994. S. Kondo, et al., “Extensive Surgery for Carcinoma of the Gallbladder,” British Journal of Surgery, Vol. 89, No. 2, 2002, pp. 179-184. J. C. Otero, et al., “Gallbladder Cancer: Surgical Results after Cholecystectomy in 25 Patients with Lamina Propria Invasion and 26 Patients with Muscular Layer Invasion,” Journal of Hepato-Biliary-Pancreatic Surgery, Vol. 13, No. 6, 2006, pp. 562-566. K. M. Hardiman and B. C. Sheppard, “What to do when the Pathology from Last Week’s Laparoscopic Cholecystectomy is Malignant and T1 or T2,” Journal of Gastrointestinal Surgery, Vol. 13, No. 11, 2009, pp. 2037- 2039. P. J. Shukla, et al., “Revision Surgery for Incidental Gallbladder Cancer: Factors Influencing Operability and Further Evidence for T1b Tumours,” Health Promotion Board (Oxford), 2008, Vol. 10, No. 1, pp. 43-47. M. Goldfarb, S. Brower and S. D. Schwaitzberg, “Minimally Invasive Surgery and Cancer: Controversies Part 1,” Surgical Endoscopy, Vol. 24, No. 2, 2010, pp. 304- 334. J. Fleshman, et al., “Laparoscopic Colectomy for Cancer is not Inferior to Open Surgery Based on 5-Year Data from the COST Study Group Trial,” Annals of Surgery, Vol. 246, No. 4, 2007, pp. 655-662. The Clinical Outcomes of Surgical Therapy Study Group, “A Comparison of Laparoscopically Assisted and Open Colectomy for Colon Cancer,” New England Journal of Medicine, Vol. 350, No. 20, 2004, pp. 2050-2059. J. J. Carter and R. L. Whelan, “The Immunologic Consequences of Laparoscopy in Oncology,” Surgery Oncology Clinics of North America, Vol. 10, No. 3, 2001, pp. 655-677. A. Belizon, et al., “Persistent Elevation of Plasma Vascular Endothelial Growth Factor Levels during the First Month after Minimally Invasive Colorectal Resection,” Surgical Endoscopy, Vol. 22, No. 2, 2008, pp. 287-297. J. M. Foster, et al., “Gallbladder Cancer: Defining the Indications for Primary Radical Resection and Radical Re-Resection,” Annals of Surgical Oncology, 2007, Vol. 14, No. 2, pp. 833-840. T. Wakai, Y. Shirai and K. Hatakeyama, “Radical Second Resection Provides Survival Benefit for Patients with T2 Gallbladder Carcinoma First Discovered after Laparoscopic Cholecystectomy,” World Journal of Surgery, Vol. 26, No. 7, 2002, pp. 867-871. H. Onoyama, et al., “Does Radical Resection Improve the Survival in Patients with Carcinoma of the Gallbladder who are 75 Years Old and Older?” World Journal of Surgery, Vol. 26, No. 11, 2002, pp. 1315-1318. K. Ouchi, J. Mikuni and Y. Kakugawa, “Laparoscopic Cholecystectomy for Gallbladder Carcinoma: Results of a Japanese Survey of 498 Patients,” Journal of Hepato-Biliary-Pancreatic Surgery, Vol. 9, No. 2, 2002, pp. 256-260. Y. Fong, W. Jarnagin and L. H. Blumgart, “Gallbladder Cancer: Comparison of Patients Presenting Initially for Definitive Operation with Those Presenting after Prior Noncurative Intervention,” Annals of Surgery, Vol. 232, No. 4, 2000, pp. 557-569. S. Y. Cho, et al., “Comparative Analysis between Clinical Outcomes of Primary Radical Resection and Second Completion Radical Resection for T2 Gallbladder Cancer: Single-Center Experience,” World Journal of Surgery, Vol. 34, No. 7, 2010, pp. 1572-1578. S. P. Shih, et al., “Gallbladder Cancer: The Role of Laparoscopy and Radical Resection,” Annals of Surgery, Vol. 245, No. 6, 2007, pp. 893-901. P. Sooriakumaran, et al., “Port-Site Metastasis after Laparoscopic Surgery: What Causes them and What can be Done to Reduce their Incidence?” British Journal of Urology International, Vol. 103, No. 9, 2009, pp. 1150- 1153. S. Towfigh, et al., “Porcelain Gallbladder is not Associated with Gallbladder Carcinoma,” American Surgeon, Vol. 67, No. 1, 2001, pp. 7-10. K. Tsukada, et al., “Lymph Node Spread from Carcinoma of the Gallbladder,” Cancer, Vol. 80, No. 4, 1997, pp. 661-667. T. M. Pawlik, et al., “Incidence of Finding Residual Disease for Incidental Gallbladder Carcinoma: Implications for Re-Resection,” Journal of Gastrointestinal Surgery, Vol. 11, No. 11, 2007, pp. 1478-1486. T. Takada, et al., “Is Postoperative Adjuvant Chemotherapy Useful for Gallbladder Carcinoma? A Phase III Multicenter Prospective Randomized Controlled Trial in Patients with Resected Pancreaticobiliary Carcinoma,” Cancer, Vol. 95, No. 8, 2002, pp. 1685-1695.